I remember banging away at my mom’s typewriter when I was a kid, and yes I did say typewriter and not computer. She had one that we would haul out of the closet from time to time, plug in to the wall, and use to type letters or just play with kind of as an expensive source of amusement. This was in the late 1980’s before most homes had a computer and even though her typewriter did need to be plugged in it was merely so the physical action of pressing a key would then trigger a small motor that would activate the individual mechanical lever for the corresponding type hammer. This thing had no screen, no mouse, and used a physical ink ribbon that had to be refilled if letters started appearing as light gray. It wasn’t the most efficient way to get things done, and we always kept a small bottle of White-Out handy when using it, but without a computer screen we didn’t know any different at the time and it was a pretty useful and practical way to engage in written communication. Of course my mom’s typewriter was far more modern than the one in this picture, and far more functional as well given that this one has some sort of plant growing out the top, but seeing this Royal model and taking its picture did bring me back a few years to what I guess you could say was a much simpler time. When I took this photo my wife and I had just eaten lunch at a local diner called Granny’s (kind of appropriate, I suppose, given the subject of the picture) and were on our way back to the car when I saw this collection of old household items sitting outside a store called The Nook. Something about the colors really stood out to me, and I thought about trying something a bit different and taking a shot straight on instead of with my usual foreground/background composition, but there were too many cars parked in the way and my 50mm lens was not wide enough to get that kind of a picture. So I went with what works and I’m pretty happy with how things turned out. I think you have succeeded in portraying the emotion in this photograph, at least for those of us who ever used a manual or electric typewriter. It brought back memories of learning to type in high school. My parents had a long carriage electric typewriter that seemed to be very heavy, so was always left in the same place to be used when needed. I, too, once banged away on my Mom’s Royal typewriter, using those little white sheets of paper to correct my many mistakes. I remember the D key stuck all the time as I feverishly tried typing out my stories. I typed out one, did the illustrations for it, stapled it together, and produced my first booklet. It was a story called, The Lost World. I still have it to this day. I remember putting that old typewriter away, to instead write the rest of my stories with Parker pen in hand. After writing 8-Ball with that pen, I wanted to have it bronzed, but it finally fell apart and was eventually trashed. Tom, for a little while there I was thinking you were going to go all nostalgic on me and wish for the good old days to be back again…and then I read your last line. Haha! I remember typing on these old mechanical klunkers when I was a kid, and honestly, it’s soooo much better now. 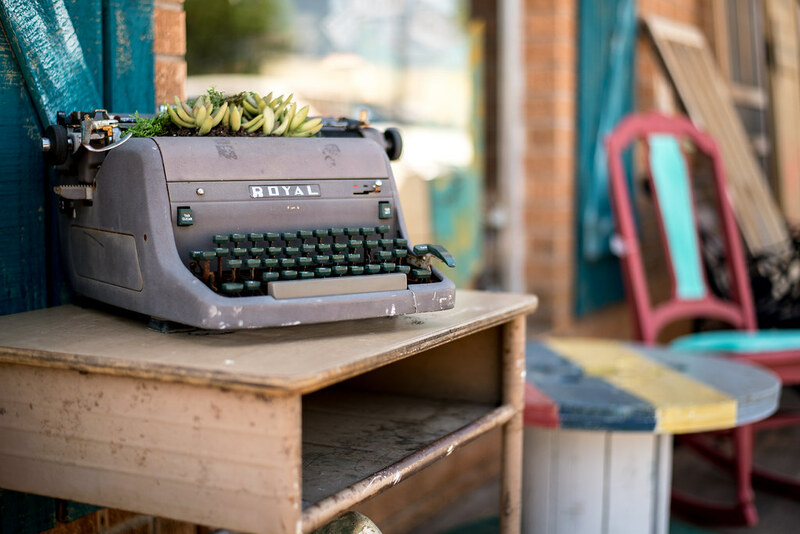 The Royal typewriter made a interesting centerpiece for this week’s post. Two things stand out to me. First, there IS a mixture of colors which give this photo a good feeling. Second, f1.8 is wider than you normally shoot at. How far back were you standing from the typewriter when you took the shot? Finally, the comment you made on sensor size of the D 750 v. the D 7100 has intrigued me. The D 7100 has a 24mp sensor. I thought that the higher the mp number the greater detail the camera could capture. Can you give a brief statement on “full-frame” cameras and how they differ? Good question about the distance, David. I don’t remember exactly but I’d probably guess I was about ten feet away from the typewriter. The nice thing about shooting full frame is you can still get some nice background blur even if you have to be a bit farther back! • Crop is good for wildlife since it (sort of) increases the focal length of your lens. Thank you, Simon! I guess I know what I will be researching the rest of the week! Good luck David! It’s a simple difference, really: crop cameras like the D7100 have a sensor that is smaller than full-frame cameras like the D750. But that simple difference has a lot of profound and often confusing implications…it’s enough to make your head spin! Back to the photo. Just viewed it on Flickr and when enlarged, the typewriter makes for a really great picture by itself.